From the Primordial Musical Ooze to the Birth of Doo-wop. What is this glorious music we call doo-wop? It’s a style conveying naivete and young love in a way no genre did before. It’s an attitude harking back to the birth of the teenager in the 1950s. For a lot of us, it represents nostalgia for an era we may or may not have experienced. Technically, doo-wop is an amalgam of five key characteristics that are explored in the 24-page booklet that accompanies this CD and richly evidenced in the choice of recordings. This CD, the first in a set of six, covers the formative years of doo-wop, offering astonishing vocal harmonies, vibrant instrumentation and a fun collection of songs that will not fail to please the amateur while being of interest to the serious collector. 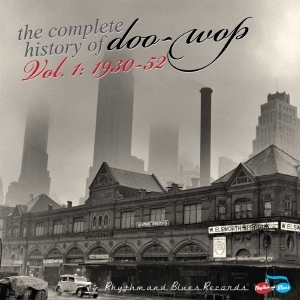 Compiled and annotated by Anthony J Gribin & Matthew M Schiff, the Doctors of Doo-Wop.